#FrappuccinoOfTheWeek – 2 new Frappuccino ideas! 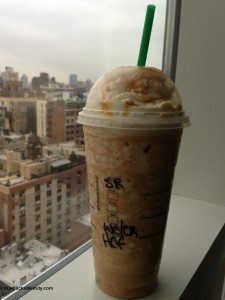 Every Monday, I bring you a new “Frappuccino of the Week” and /or “Drink of the Week.” These are your, reader-submitted drink and Frappuccino ideas. We’re gearing up for summer weather and Frappuccino Happy Hour, which is May 1st – 10th, from 3:00 PM to 5:00 PM. Lindsay says that to order this, order a Grande Vanilla Bean Frappuccino with heavy whipping cream as the dairy, an extra scoop of vanilla bean powder (that’s four scoops for the Grande for this drink), and use a Venti scoop of ice. Two shots of espresso are poured on top. Lindsay recommends no whipped cream for the best result. I tried this one – it’s the first time I’ve ever tried using heavy whipping cream as the dairy. Wow. It’s quite a dessert! Thomas, a customer and reader in New York City, submitted this drink suggestion. Thomas says that for about 8 years, he’s been a regular at the Starbucks at 85th and Lexington in NYC. 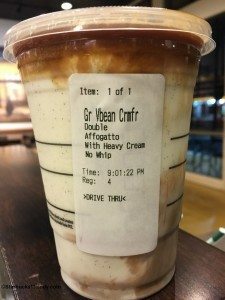 Originally, this “Frappuccino of the Week” suggestion called for hazelnut drizzle atop the whipped cream, however Starbucks has discontinued the hazelnut drizzle, so don’t expect to find that in stores. Order a Venti Hazenut Crème-based Frappuccino and add three ristretto shots of espresso. I sent both Lindsay and Thomas a $10.00 Starbucks Reserve Roastery and Tasting Room card as a thank you for the submissions. If I use your submission, I will mail you a thank you! To submit a drink of the week or a Frappuccino if the week, put in the subject line either “Drink of the Week” or “Frappuccino of the Week,” and email me a full drink photo to Melody at StarbucksMelody dot com. Please introduce yourself to me if I don’t already know you. Peru: A Special Seasonal Starbucks Coffee Offered in Europe & the Middle East. Missed out on unicorns? Now there’s Narwhals and Mermaids! Frappuccino of the Week: This one tastes like a Frosty! The Affogato promotion from several years back (pre transformation agenda) had legs for a while (like the doubleshot, people continued to order it well past it’s disappearance off of the menu boards). I’ve heard of people going the breve route since the made your way frappuccino launch, but I’ve never tried it – I’d need a Chantico-sized cup if I were to try it, but those that like it swear by it. 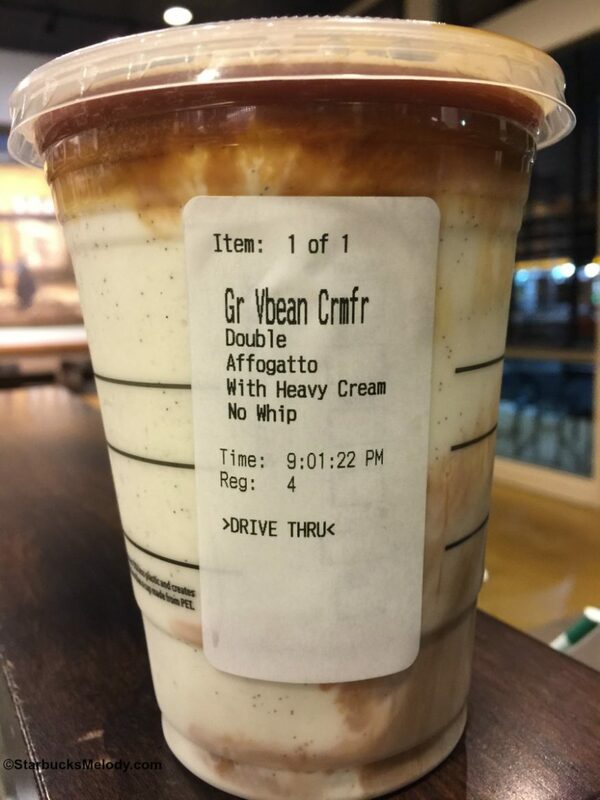 Oh wow, that Grande Vanilla Bean Frappuccino Affogato sounds and looks delicious! Hope to remember this one during the Frappuccino happy hour next month. What do you mean by Starbucks discontinuing the hazelnut drizzle? Is it gone forever? What will become of the hazelnut macchiato? The hazelnut drizzle and vanilla drizzle were initially launched last winter/spring promotion for the elevated macchiato platform. Unfortunately, when both were no longer featured on the menu board, sales declined. While some are disappointed that they are gone, as a partner, I was relieved when we they told us it was going away. Both the hazelnut and vanilla were difficult to squeeze out of the bottle. Neither drink was very popular at my store and we threw away more than we actually used. If you liked the Hazelnut Frappuccino, you can still order it. Just ask for a Coffee Frappuccino plus Toffee Nut syrup and whipped cream; it won’t come with the drizzle but otherwise everything else is the same. These sound great! I am looking forward to the happy hour. A a former partner, I have tried many different frappuccinos (please note that I generally don’t drink them). However, I have to say that I tried Lindsey’s affogato one and it has been added to my list. Thank you sharing this recipe and keep up the great work on your blog!! !